A structure and its precalculated pocket measurements can be retrieved by PDB ID from the Computed Atlas of Surface Topography of proteins (CASTp) database using Fetch by ID or the command open (with prefix castp:). The database does not contain all PDB entries, and structures may be older versions of the current PDB entries. 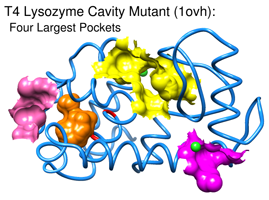 Results for a structure not in the CASTp database can be shown in Chimera by requesting a calculation at the CASTp server and opting for results to be returned by e-mail. After the results have been received and unzipped, opening the file named *.poc in Chimera automatically also reads files with the same name/location except the suffixes .pdb, .pocInfo, .mouth, and .mouthInfo. T.A. Binkowski, S. Naghibzadeh, and J. Liang, "CASTp: Computed Atlas of Surface Topography of proteins" Nucleic Acids Res 31:3352 (2003). J. Dundas, Z. Ouyang, J. Tseng, A. Binkowski, Y. Turpaz, and J. Liang, "CASTp: computed atlas of surface topography of proteins with structural and topographical mapping of functionally annotated residues" Nucleic Acids Res 34:W116 (2006). Retrieving/opening CASTp results in Chimera shows the structure in the main graphics window and associated data in a dialog, or Pocket List. 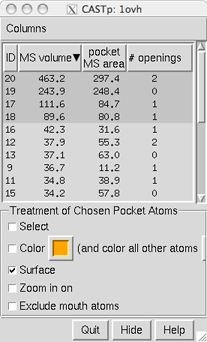 Each row in the dialog describes a pocket, which could be an internal cavity completely enclosed by atoms or a indentation with one or more openings to the external surface. Measurements are with respect to the molecular surface (solvent-excluded surface; probe contact + reentrant) or the solvent-accessible surface (that traced by the probe center). Column display settings are saved in the preferences file and used for subsequently retrieved CASTp data. If the pocket list is hidden or obscured by other windows, it can be raised using its instance in the Tools menu. The pocket list can be sorted by the values in any displayed column by clicking the column header. Clicking the header once sorts the entries in order of increasing value and places an up arrowhead (triangle) in the header. Clicking again sorts the entries in decreasing order and places a down arrowhead (inverted triangle) in the header. A pocket can be chosen by clicking on its line, and multiple pockets can be chosen at once. Chosen lines are highlighted in the dialog. Ctrl-click toggles the status of a line, while clicking on the first (or last) line of a contiguous block and then Shift-clicking on the last (or first) chooses all of the lines in the block. Option settings are saved in the preferences file and used for subsequently retrieved CASTp data. Hide hides the dialog without removing it; Quit removes the dialog and the structure. Help brings up this manual page in a browser window.